A polychrome enamel saucer of square form with indented corners and supported on a short foot. The interior is painted with a group of scholar’s objects against a white enamel ground, including a blue decorated vase containing yellow and red flowers, a wheeled bird-like toy with floral decoration on its sides, a rectangular incense burner in the form of a fang ding, a tall vase in the form of a fang gu containing branches of plum blossoms, a ruyi sceptre and a feathered fan, an incense burner in the form of a mythical creature, luduan, which sits on a stylised stand, and a slender neck vase containing peacock’s feathers, chopsticks and a spoon. The cavetto is decorated with endless knot patterns in blue against a pink ground, whilst the exterior is adorned with stylised chi-dragons in blue against a light green background. 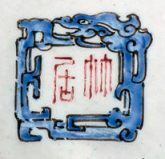 The base is covered in white enamel and painted with a two-character mark, Ling Ju (‘Residence in the Forest’), encircled by a stylised chi-dragon in square form. The edges of the rim and the base are gilded. Painted enamels of this kind are commonly known in English as ‘Canton enamel’, after the main centre of their production in South China, Canton (Guangdong). The exact date of the introduction of painted enamels into China has not hitherto been recorded, but it has been suggested by M. Soulié de Morant that foreign missionaries brought the technique to Guangdong as early as 1683 and to Beijing in 1685. The technique of painting in colours on enamel requires a strong metal body, which is coated with white enamel. Studio marks, in this case ‘Ling Ju’, occur frequently on Canton enamels. The decoration of scholar’s objects, also known as ‘hundred antiquities’, depicts the comfortable lifestyle of the scholars and their leisurely pursuits. A closely comparable square painted enamel saucer, decorated with similar scholar’s objects and dated to the Qianlong reign (1736 – 1795), was exhibited at the Ashmolean Museum, Oxford in 1978. 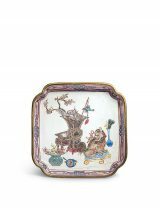 Another square saucer painted with flower and fruit design, dated to the late Qing period, is in the collection of the Palace Museum, Beijing. 5 Compendium of Collections in the Palace Museum, Enamels-5: Painted Enamels in the Qing Dynasty (1644-1911), Forbidden City Publishing, Beijing, 2010, no. 297, p. 369.